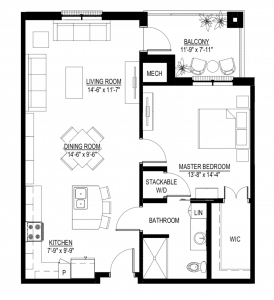 The Pamlico apartment home at Trinity Landing: Little living, big lifestyle! In a couple short years, Trinity Landing will be the newest senior living option in Wilmington, N.C. A resort-like community for active seniors, Trinity Landing will rest right on the shores of the Intracoastal Waterway, offering beautiful views, standout amenities, exceptional services and a welcoming community. Above all else, residents will have the opportunity to select and customize their newly constructed residences, and choose from 22 available layouts. Trinity Landing will offer both apartment homes and single-story villas, so you’ll find a floor plan that perfectly fits your unique wants and needs. As more people are beginning to embrace simplified living spaces, they’re gaining the freedom and time to do the things they truly enjoy. If you’re keen on how that sounds and looking for a low-maintenance residence that allows you more time to spend in the community, discover the Pamlico apartment home at Trinity Landing. The Pamlico residence offers 870 square feet, a spacious master suite, a balcony, a walk-in closet, an open-concept kitchen and a dining and living area. Once you enter this residence, you’ll see for yourself the benefits of an open floor plan. From the moment you enter the front door, you can see across the entire living space, all the way to the bright windows on the far wall. This layout creates a large, open feel, and it provides a perfect place for hosting friends and family. And speaking of hosting, the well-appointed kitchen with contemporary appliances, fixtures and designs will be the perfect venue to do so. The Pamlico apartment home at Trinity Landing also features a large outdoor balcony, allowing you to take in the gorgeous coastal Carolina views. There’s enough room for some furniture and planters as well, making it a comfortable outdoor living space. You’ll have the option to spend your mornings enjoying the waterside peace outdoors, or spend some time in the afternoon sunshine reading or tending to your greenery. The Pamlico’s master suite, which is adjacent to the living space, includes a large walk-in closet to store all of your belongings. The windows allow you to look out over the balcony, giving you a view of your personal decorations and the green space of the Trinity Landing campus beyond. The bedroom also includes a full-size, stackable washer and dryer tucked behind a closet door, so you won’t have to carry your laundry far. Whether you choose the Pamlico apartment home at Trinity Landing or a different layout, you’ll be able to take full advantage of the services and amenities that make community living here a breeze. Yard work, landscaping and home maintenance will be a thing of the past. Our community maintenance team will take care of all the hard work for you, leaving you more time to enjoy the waterfront and the charming coastal town of Wilmington. As a future resident of Trinity Landing, you can join clubs and groups, attend social events, expand your horizons with continuing education opportunities or volunteer your time to a worthy cause – all on campus. Just a short drive away in and around the town of Wilmington are seemingly endless beaches, as well as cultural and educational attractions, entertainment and more. Whatever you choose to do, you’ll come home at the end of the day to your comfortable, newly built apartment home customized just for you. For more information about residences at Trinity Landing, give us a call at 910-769-9600, or visit us online and request your personal appointment. We look forward to getting to know you! Can’t wait to move up on the list!! !